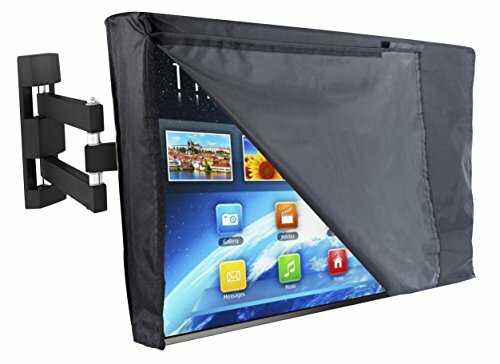 WHAT MAKES THE OUTDOOR TV COVER WITH OPEN FLAP DIFFERENT? Now it's so easy to watch while protecting your TV from dust. You don't have to take off the whole TV cover, all you need to do is to flip the front and you are ready to go. No transparent plastic that reflects, making it hard for you to watch the TV clearly. When you are not using it, all you need to do is to put the flap down, attached the velcro securely and your TV is now 100% protected from dust, sun and snow. Our TV Cover measures 55 x 35 x 4.5 inches which ensures that your Television is Covered. The openings of our cover has Velcro straps installed, making it durable and built to last for a longer period of time, compared to ones made with zippers. It also has a small pouch for your remote control. It is dust-proof, waterproof, and weatherproof, so you wouldn't have to worry about your TV's condition once our TV cover is in use.